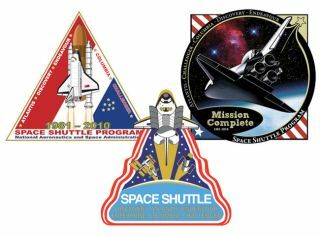 Three of the 15 finalist designs in NASA's space shuttle commemorative patch contest. To see all 15, see collectSPACE.com. NASA's space shuttle program held an in-house contestover the past few months to have its prior and present employees design acommemorative patch marking the orbiters' upcoming retirement scheduledfor later this year. Eighty-five submissions were offered by space programworkers ranging from shuttle technicians to flight controllers toastronauts. Shuttle program managers, serving as judges, recently chosetheir 15 favorite designs to take part in a "People'sChoice" poll among NASA'semployees. The judges will take into account the result of thatvote when selecting the winning artwork, which will fly aboard STS-132,the final scheduled flight of space shuttle Atlantis. The open-to-employees-only People's Choice poll runs from Jan. 11 throughJan. 29. After hearing the desire for a public vote, collectSPACE.comorganized its own Fans'Choice poll. Though unofficial, the Fans' Choice will beopen for the same dates as NASA's official poll to learn ifthe fans pick the same design as the employees. NASA’s spaces shuttle program is slated to end in the fall after fivefinal missions to complete the International Space Station. The agency’snext shuttle flight – the STS-130 mission of Endeavour – is set tolaunch on Feb. 7. View and vote now on the "Top 15" spaceshuttle commemorative patches at collectSPACE.com. Copyright2009 collectSPACE.com. All rights reserved.